... but the RNG are even more broke now. Tell me again why we should go in-land and to military bases? Because the military in Chernarus did not use military grade weapons, that is for sure. Not a single M4 or AKM for 5 hours of gameplay on two different servers through 5 military facilities (from pavlovo, zelenogorsk, kabanino, NWAF and tisy and changing server, backtracking down to pavlovo again) and not finding anything else than hundreds of attachments, magazines, flashlights and stocks. The AR's should be somewhat hard to come by... But come on. There has been a full fledge war against zombies, with military involved. No one left an automatic rifle around.... Anywhere? You are not making the game harder in any way by changing up the RNG like this. Just more boring and contributing to duping and even more KOS. People are not even trying to talk now, they just shoot on sight, hoping you got an AR because they are so rare it's rediculous. I'm ok with the rifles and smg's but hiking for 5 hours through several MB's should let you find an AR.... no? What is most interesting, the mission of offline has a good spawn of objects. I do not have a shortage of anything. I think that servers have settings for reduced supplies and the place where items are spawned, they get half the seats in the spawning period. I do not want to contact server administrators about this, and challenge their decisions and their intention to influence it. Try other servers, I see a big difference in some servers. You're gonna have to search harder son, this is not Call Of Duty. yeah, I only found one M4 recently since the patch update, but no KAM's, so I dont know what the deal is that these are so "rare" or if it was developments intention to do this, but mostly finding SKS's or SG5's at mil bases. I would of thought they would have made the SKS a civilian spawn as these are not "current" mil deployment weapons, but the mosin and sks which use the PU scope "civilian spawn" are old mil weapons and the sks spawns at mil locations and the mosin is civilian, makes no sense? The M4/KAM/USG45/SG5 should be mil spawns and the sks should be civilian spawn imo. LOL.. I just love replies like this. Yeah, the sks is all over the MB's. SG5 should be a police station spawn all the time. 1. Where did you find such an explanation? 2. For what period of playing time does the economy counter act before the economy counter is reset? 3. How do you explain the reduction of the locations of the generation of subjects by 50% on some servers? For example - in the police station there are 6 places of generation of the subjects in one generation period, but on the server I can find only three subjects in one period of generation of subjects. 4. How types.xml regulate economics for 10 players on a server or for 60 players on a server? 5. How does the types.xml of some servers produce such a spawn - many identical items for one place and spawning period? 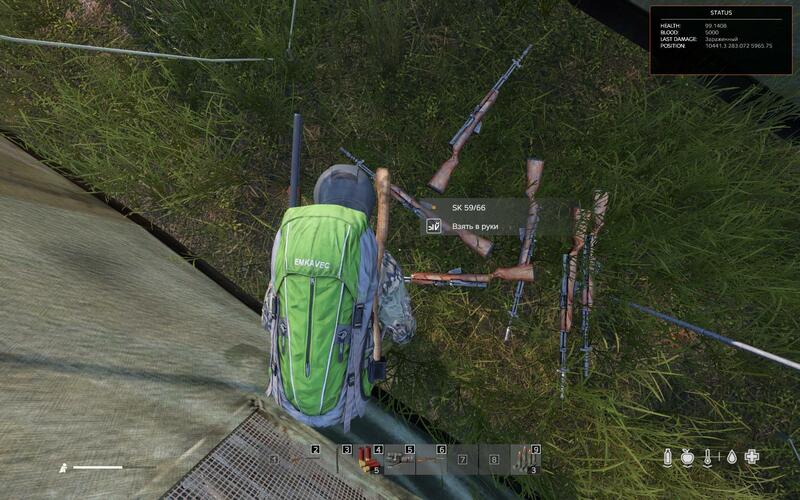 In the screenshot, I collected six rifles in military tents. 6. Server administrators are related to the incorrect behavior of the economy? An assertion without evidence! Dismissed as dogma. nominal- same as max if max is not used, otherwise used as a "nominal"
- count_in_cargo="1" - if 1, FAL wont spawn if there are already 4 fals stashed in tents, vehicles etc. Thanks for all the answers, they will be useful for understanding by all who have not read this before. I play on the server, which is often rebooted, the server reboots every 4-8 hours - I do not have problems associated with the tedious search for any weapon or property. All my questions were suggestive, directed to thinking and conclusions - play on servers where server administrators do not cut economics, create conditions with an easy search on the server of any content, normal for all content mining. Or any issues related to the economy and its settings, you need to decide with the administration of the server where you like to play. You been warned twice before for your trolling, and you keep on ignoring it. 30 days suspension, last and final warning. Sorry guys, for doing my business out in public like this, but I'd like to take the time to remind you all of the 'report' button. It's in the top right corner in every post. Using it on posts like the one quoted is a great help, as we can't be everywhere (or even anywhere, some times), and having pointless and flamebaiting posts filtered out makes the forum better for everyone. Thanks. Had the same issue. Only way I have found around this is to look for someone's else's base and relieve them of one or two. Have not come a cross a base or stash in months. This is an XBox discussion board, not PC.